London: Longmans, Green, & Co., 1880, 1880. FIRST EDITION. 1 vol., 8-5/8" x 5-7/8", illustrations from drawings by A. Y. Bingham, 2 folding maps. Bound in 3/4 brown morocco, ribbed gilt decorated spine, top edge gilt, others uncut, by Worsfold. Inner and outer hinges fine, head and foot of spine fine. The couple had five children together before they traveled aboard their luxury yacht Sunbeam. The yacht was said to have been named after their daughter - Constance Alberta - who was nicknamed Sunbeam; she died of scarlet fever aged four, on 24 January 1873. The golden figurehead of the yacht depicting her is at the National Maritime Museum, Greenwich, London, UK. 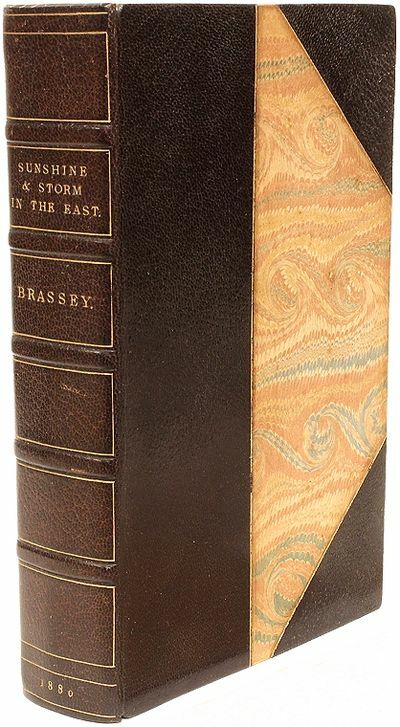 A Voyage in the Sunbeam, describes their journey round the world in 1876-77 with a complement of 43, including family, friends and crew, ran through many English editions and was translated into at least five other languages.